Apple Crisp/Crumble is a simple baked dessert with a s very nice crisp and crumble topping with tender apple bites inside. The combination of oats, apple and Brown sugar tries to give it a healthy way and if served with a scoop of vanilla ice cream or whipped cream it is really delicious. Preheat the oven to 350 Degree F. Grease a baking tray and set aside. 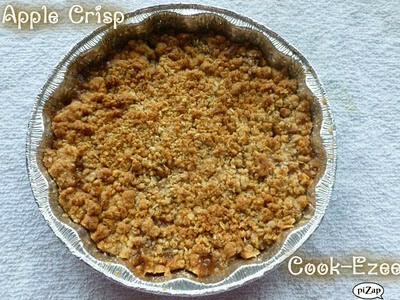 Put the apple-mix in the greased bake-ware and spread the topping evenly over the apples. Bake for around 35-40 minutes until the topping is golden brown. Remove from the oven and let it cool for sometime say 30 mins. Serve warm or with a scoop of Vanilla Ice cream or whipped cream. Enjoy!!!!!! I am sending this to Ramyasrecipe's 'A for Apple' Event. Happy Cooking. this is my fave, but I never tried making at home. Thanks for your participation.